As academics on a semester system know, Thanksgiving break offers the false hope of a brief interlude before the final dash to the end of the semester. Thus I surfaced for air long enough to waste some time playing around with a few new-ish digital toys that might be of interest to others. First, for those who use Pocket Informant’s calendar/task-management program, their recent update includes a macro-view (all the cool kids are doing Big Data these days) of your schedule, a heat map indicating how busy your days are over months. As you can tell from the screenshot, I follow the stereotypical academic’s schedule of attempting to keep my summers for my research. The map is fully searchable, you can add various ‘markers’ and icons, modify the formatting of each point, add images, create floating points (when you’re not yet sure where exactly they should go), and it automatically makes an outline that you can export (upper right in screenshot). 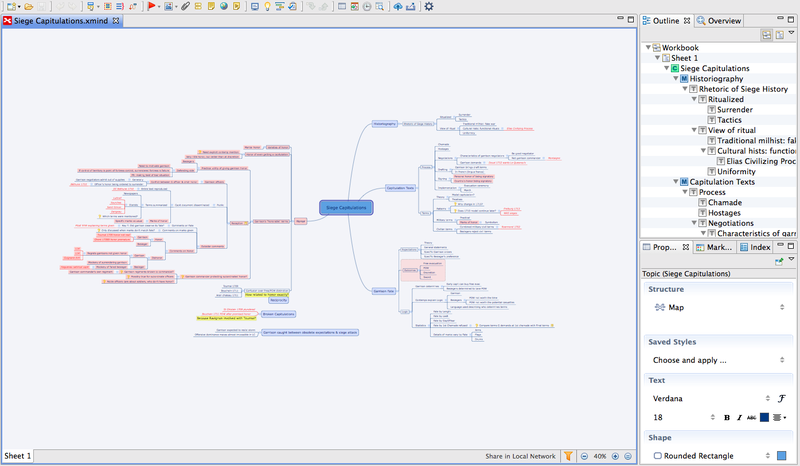 I find it useful to see the big picture on a single page (scrolling and zooming in and out as necessary), and to quickly see the ‘shape’ of the argument and the relative amount of detail in each section, rather than flip between a dozen pages of outline and try to imagine how a subpoint would fit in a different spot. 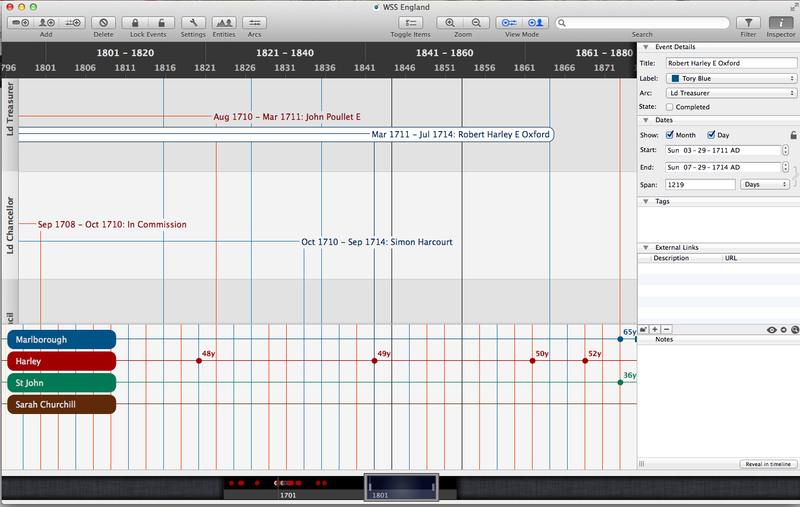 Finally, my frequent reliance on timelines in my courses led me to take the plunge and explore timeline software. My über-efficient timecharts have their uses, but I don’t want to put that amount of effort into all sorts of chronologies in the dozen different courses I teach. Sorry, but the 20th century isn’t worth that much effort. And for my own research purposes, the more info in a given timeline, the greater the need to have the info quickly searchable. Enter Aeon Timeline. Items are generally divided between Entities (people, institutions, technologies…) and time-defined Events. You can use different levels of precision for different Events, and you can place Events on various arcs, e.g. 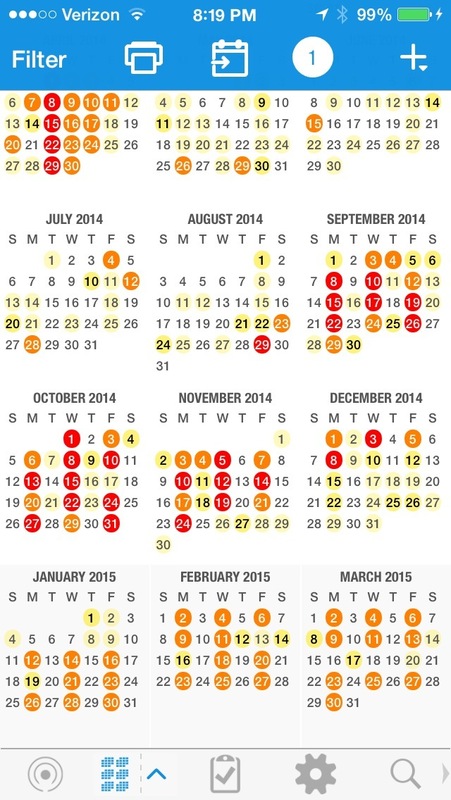 an operational timeline might include separate arcs for each theater of operations. 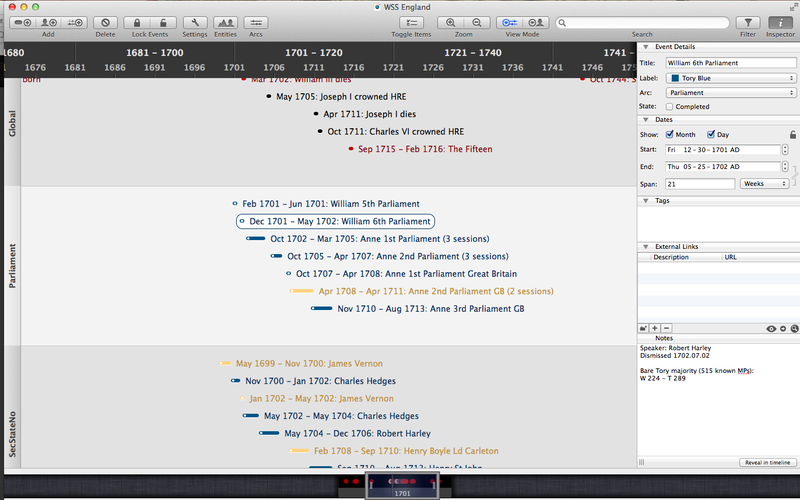 Befitting the digital data, all entries and metadata are searchable, and the timelines are zoomable in both directions. You can add notes to each Entity and Event, and there are a few limited formatting options (with possibly more to come in future versions). So in the operational arcs I indicate the Allied sieges with a red font and the Bourbon sieges with a blue font; in the English politics arcs I use buff to indicate the Whigs and blue to indicate the Tories. You can import images, for example peoples’ portraits or even simplified maps of battles and sieges. You can also filter your results to show only a subset of the events and entities, based off of the metadata. You can also import in massive quantities of data in csv or tab-delimited, rather than use the individual event creation dialog box. Further, you can define a Relationship between each Entity and each Event – e.g. an Entity might have one Event that was its birth, another its death, while another Event of that Entity (say, a person) might be that individual’s participation in a particular siege. This view is a bit messy in the Event (top) half of the window – you should primarily just look at the bottom half, in the Relationship view, which allows you to see all the events that each entity was involved with – and even how old the given Entity was, if you want. The developer promises to make this view more intuitive in future versions. And, if I were ever to make my own WordPress blog site (i.e. 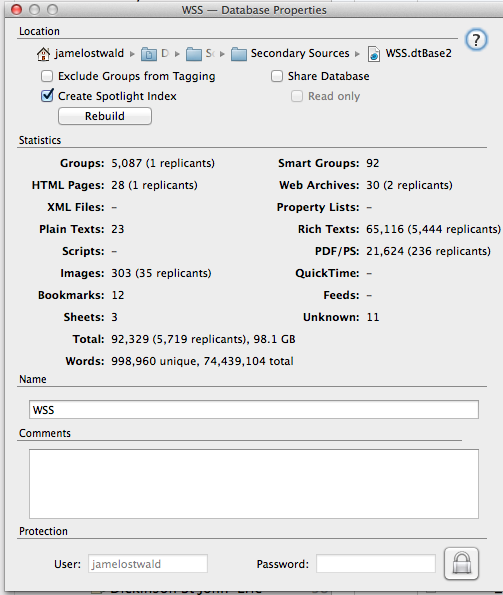 not use wordpress.com), I could export the timelines in simile format and post interactive versions online. So that’s how I spent my Thanksgiving week, when not eating turkey, that is.